Ever feel like you need a third hand in the kitchen? WellStir Crazy ~As Seen on TV gives you just that... a third hand so you can get more done in less time in the kitchen. Now you can stir without having to stir! Simply place the robotic Stir Crazy in a pot or pan, turn it on, and let it do it's thing...you don't have to worry about your food because Stir Crazy will do the work for you. Stir Crazy is safe for non-stick and works with any pot or pan, can operate for up to 4 hours in temperatures up to 300 degrees Fahrenheit. 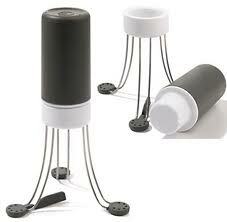 Stir Crazy's specially designed legs will cover every area of your pot or pan so food is thoroughly stirred. Your soups and sauces won't stick to the bottom ever again!